What happened to fundamentalism and liberalism after the ruckus died down? In the long run, was the fundamentalist-modernist controversy a “tempest in a teapot,” or a significant event in modern American religious history?To help us bridge the gap between the 1930s and today, Christian Historyspoke with George Marsden, professor of history at the University of Notre Dame. George is author of the now classic Fundamentalism and American Culture (Oxford, 1980). What happened to fundamentalism after the 1930s? 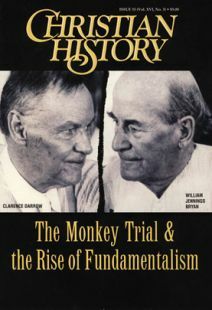 After losing a number of public battles, like the Scopes trial, the fundamentalists regrouped; they formed independent denominations, Bible churches, and parachurch and revivalist organizations. They mobilized the radio—Charles Fuller and his Old Fashioned Revival Hour is a good example. The watchers of mainstream culture were writing off fundamentalism, assuming that as people became more educated they would become more liberal. In fact, fundamentalism was moving on the popular front and was still quite effective. In the 1970s, Jerry Falwell revealed to the country that fundamentalism had not gone away and was still a powerful movement. Liberalism flourished, and mainline Protestant churches were very influential in the culture; they tended to think they spoke for Protestantism in America. For instance, in the 1940s, major radio networks were expected to donate some time for Catholic, Jewish, and Protestant programming. The National Council of Churches, which determined who would represent Protestantism on this free air time, refused to invite fundamentalists to participate. Charles Fuller arguably had the most popular religious radio program of the day—air time for which he paid. When he demanded equal free time, he was refused. This “control” of Protestant culture, of course, weakened in the sixties and seventies as mainline Protestantism fragmented, and mainline churches started losing members. So even though liberals controlled the media, they didn’t sabotage the appeal of fundamentalism. The cultural center doesn’t control lots of things that are going on in subcultures on the periphery in American life. Fundamentalism is a pretty good illustration of that. Fundamentalists have a reputation for majoring in minors, worrying as much about card playing and dancing as about inerrancy and the Incarnation. Is that fair? Bans on smoking, drinking, dancing, and such have always been a feature of revivalist Christianity—evangelical and fundamentalist. At evangelical Wheaton College, for example, social dancing is still forbidden. However, behavioral tests are no longer as important as political tests. Today fundamentalists would have serious doubts about a believer who is a political liberal. Have fundamentalists borrowed anything from liberalism? Perhaps one thing fundamentalists now share with liberals is a therapeutic model of ministry. Fundamentalists are still serious about doctrine, but they now have an entire industry that helps people talk about feelings and deal with relationships. Naturally, fundamentalists handle relational topics differently than do liberals, but they often traffic in the same therapeutic language and assumptions. Have liberals learned anything from fundamentalists? Liberals have learned that it’s difficult for the church to survive if there’s nothing that makes the church distinct from culture. If all we need are social agencies or schools, church becomes superfluous. So liberals have become more concerned about doctrine, though they would hardly share the same doctrinal stands as fundamentalists. Did the fundamentalist-modernist controversy impact the larger American culture? The controversies of the 1920s strengthened the hand of people who wanted to secularize the culture; they were able to argue that religion is divisive, and the way to keep the peace is to restrict religion to the private domain. Also secularism became more dominant in mainline Protestant schools, which reacted strongly against fundamentalism. For instance, one message mainline Protestant colleges sent to their constituencies in the 1930s and 1940s was this: “We’re religious, but we’re not fundamentalist!” That reaction tended to move them further from their particular religious identities, so that today many Presbyterian and Baptist colleges are just as secular as Yale and Harvard. What did the controversy reveal about ongoing issues in American culture? In America it’s been assumed that a single, government-run school system can teach values that will satisfy everybody in the community. That assumption developed in the day when broadly Protestant values were common. The fundamentalist-modernist controversy—especially in regards to the teaching of evolution—pointed out that cultural unity was breaking up (this is even before the mainstream allowed much room for the values of Catholics, Jews, Muslims, and other religious groups). It’s impossible for a single school system to represent all those views. We’re still facing those issues, and gradually Americans are coming to see that a single educational system is not going to work. What still puzzles you about fundamentalism? Many fundamentalists seem to hold two views at once. One is the premillennial view—culture is on the decline; it’s under God’s judgment; we shouldn’t trust in politics or human solutions because things are just going to get worse and worse until Jesus returns. At the same time, the same people will argue that we should be reforming America: America is God’s chosen nation—or was once a Christian nation and we should try to bring America back to this godly condition. On the one hand, America is Babylon and under judgment. On the other hand, America is Israel, God’s chosen nation. What do you appreciate most about fundamentalists? Fundamentalists are willing to take a stand, and that’s often been a difficult thing to do. If you let culture make tolerance the preeminent virtue, pretty soon you won’t have anything else. And so it’s good that there are Christians who have said we need to draw a line somewhere.